7) An 'export' to Word or Excel function is on the lower left portion of the screen. These are all discussed below. The Issue window gives you a Microsoft Explorer tree view and shows all of the Issues that have been set up in particular case. Clicking on any issue will make it the 'Current Issue' on upper right hand portion of the screen, as well as display all facts in the fact table associated with the issue on the right hand portion of the screen. Under this section you can create issues before you know all relevant facts pertaining to the case. On clicking 'Create New Issue' button on lower left portion of Facts & Issues screen (below Issues window), a new issue window appears. (entitled 'Current Issue: Issue Title'). To input the title of the Issue and a brief explanation (optional), click 'edit'. Once you create an Issue the screen displays the 'Current Issue Window'. Clicking 'Edit' link for a specified Issue makes it editable and allows you to make desired changes. When finished, click 'Update' to save. >Documents (typing or pasting the title of document to add to fact). >Fact To Issues: link the fact itself to existing issues. You can narrow your search, typing only information from one field to find a specific fact. This feature will look for matching facts & issue that contain one or more words specified by the user (e.g. Invoice). If you want to delete the selected Issue, click 'OK'. You can create and keep track of key facts of the case. You can create a new fact by clicking on 'Create New Fact' button to the left of the 'Current Issue Window'. On clicking 'create new Fact' button you will see the New Fact window. On clicking 'create new Fact' button you will see the New Fact window. The' New Fact' window allows you to enter a new fact, apply a date or date range, indicate if the fact is contested or not, and associate underlying documents with the fact. Title. Enter the substance of your fact in the Title field. Facts will be easier to work with if the Title refers to one fact, and not several facts or a compound fact. Task Date Start and End. The 'Start' field indicates the start date for a fact and the 'End' field the end date. If the fact occurs on a single date, enter that date in the 'start' and 'end' columns. Lexbe eDiscovery Platform allows US date formats to be used, e.g. 2/12/2004 12:00 AM. Contested. The 'Contested' field allows you to indicate if a fact is contested or uncontested, and if contested, then by whom. This allows you to identify which facts in your case are possibilities for stipulations, and which must be litigated to determine. Material. The 'Material' field allows you to indicate if a fact is material, not material, or undecided. Assign Docs to Fact. 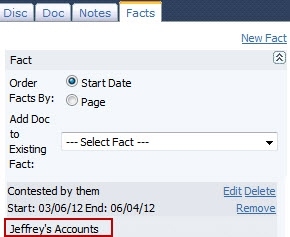 The documents field allows you to associate one or more documents with a fact. This allows you to track back a fact to its source or sources to prove up. Assign Case Participants to Fact. This field allows you to associate one or more case participants with a fact. Assign Facts to Issues. This allows you to associate Facts to one or more Issues of the case. Update or Cancel. When you have entered the fact as desired, click 'Update' to cause the information to be saved in Lexbe eDiscovery Platform. Otherwise click 'Cancel' and the fact will not be saved. Need to Sometimes Scroll Down Page. If you have a large number of facts and want to add a new fact, then to find the new fact entry area you need to scroll down the page sometimes. You can keep track of all key facts from the feature 'Show Fields'. This action will display selected columns on the main table, listing specific information related to the Facts. Click 'Edit' on furthest column to edit any of the Facts. This will make all the Facts inside your case editable and allows you to include all the important information. 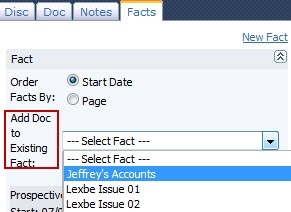 To delete a selected Fact from Lexbe eDiscovery Platform, check the boxes next to the facts you wish to delete. Then, click on the 'Delete Selected Facts' link at the left of the window. Existing Facts can be assigned to one or more issues. To do this, first select one of the issues on the upper left of the screen in the issue box by clicking on the desired issue. -From the Management>Manage Custom Doc Fields, create a new coding section for ‘Case Participants’. -Then under the 'Case Participant' section, create custom coding fields (check-boxes) for each Case Participant. This allows you to tags multiple Case Participants to the same document and even create saved/shared filters and searches. You can view a particular issue and its assigned facts by clicking on an issue folder which you wish to view in the Issues Window. Every issue will display all its assigned facts and their timeline. By clicking on any of the column headings, you can cause the timeline to re-sort by that field. Clicking on the Title/ Start/ End/ bar sorts Facts in ascending order and by clicking again sorts facts in descending order depending upon your choice. For example, clicking on the Start Date heading places all the Facts in time order. Clicking on the Title heading, places them in alphabetic order. You can also view the full content of the fact Title through a popup window by placing the mouse over the fact icon. The time line header (upper right) shows the time scale (12/22/04 to 01/01/05) and is automatically generated from the facts in the view. Each red bar shows the amount of time from start to end for the particular fact. You do not have the ability to specify a year or date only in the timeline because a date is estimated in US format (mm/dd/yy). When including a start or end date the line will extend to the date range of other items. Also, you can use an arbitrary end date (like 1/1/12 below in first item) and add EST or something else in the text to indicate a date is estimated. The column from the Excel spreadsheet will allow this action. Here you can search the contents of any the facts that you have added to your case. Don't forget to select all columns you want to work with by clicking on 'Show Fields'. To add your selected facts to a particular issue. This feature allows you to exclude/include issues based on four criteria (Contested, Material Facts, Document and Case Participant). It will edit 'Facts' based on six criteria. The columns will expand listing specific information about the facts (e.g. Issues, Contested, etc.). If you want to open documents related to a specific Fact, make sure that under the 'Show Fields' section the column 'Document' is checked. This action will display a link to the document page related to the Fact you are reviewing. When you click on the 'Doc/Page' link, the document will be carried over to Document Viewer without closing the 'Facts & Issues' page. The 'Export to Excel' button allows you to save the current view in the browser window to an Excel spreadsheet. To complete this function, click on the 'Export to Excel' button. Choose 'Save' in the dialog box that appears to save the file in Excel. Then open the downloaded file. Please note that some facts can have multiple documents and Excel does not allow multiple hyperlinks in the same single cell. For this reason, instead the Fact Id column is the hyperlink, which means that you can easily edit the Fact title column and also click on the Fact Id hyperlinks to review facts and related documents. When you click on the Fact Id link, it will take you back to the Facts & Issues page showing just that specific fact and all assigned documents. If you are the main Administrator User Account, you will also see the 'Export to Pivot' button available in the lower left of the screen within 'Facts & Issues' page. This option is a way to quickly summarize large amounts of data and create an Excel spreadsheet with the facts flattened with one fact per issue. This 'flattening' allows you to sort in Excel. Before exporting Facts to an Excel Spreadsheet, make sure that under the 'Show Fields' section the columns Issues and Documents are both checked. In the main table select all facts and then click on Export>Export to Pivot button. Your facts will then be sorted by issue with facts and multiple issues repeated. (you can also filter in Excel). 'Export to Pivot' button exports all facts to Excel, with facts repeated, one row per fact. You can limit the data to one issue in Excel. Select all the exported data and click ‘Create Pivot Table’ from the Insert menu. Insert the table in a new sheet. In the newly created pivot table, add Issues to the Report Filter area then 'Add Fact Title' and 'Doc Title' to the Row Labels. This will give you an Excel pivot table in which you can easily select which issue to filter by from the Issues drop down. In addition you can add other fields such as Case Participants as needed. You can also find more information about Excel Pivots from the Excel help pages. The 'Export to Briefcase' button allows to copy some or all Facts & Issues from a case onto a local computer or network in an zip file. To complete this function, click on the 'Export to Briefcase' button. Here you may import new Facts to the case or edit existing ones (files must be in Excel 2007 or 2010 &2013 formats with an extension of .xls or .xlsx). Fact Id- It is the unique identification in Lexbe eDiscovery Platform that will associate metadata to the respective Facts & Issue to process an update. If you are editing existing Facts, this column must be retained and cannot be sorted to disassociate with the data in each row (if improperly sorted or otherwise unassociated, data corruption will occur in the Facts & Issues page). For new Facts, just leave the rows under the column in blank. NOTE: When you import new facts (new data) into your case, it will not overwrite the existing ones. Import function feature has also the ability to import facts from CaseMap management system, with the exception of the 'Case Participants' field that was not part of the import load file. On 'Facts & Issues' page, you can assign Case Participants, Documents, Issues and Task Date Start/ End to a Fact, after importing it to Lexbe eDiscovery Platform by clicking on the 'Edit' link. 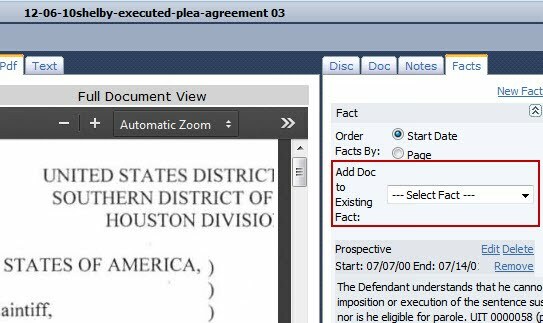 When you open a document in the Document Viewer by clicking on any link to the document in Lexbe eDiscovery Platform, from the 'Facts & Issues' page, you will be able to navigate in the Document Viewer to next/previous Doc Title, Date and Bates (one document at a time). This function is located in the upper right corner of screen. 1-From the main table click the 'Edit' hyperlink to open a specific fact that you want to link to one or more documents. 2-The hyperlink will open the Fact table. 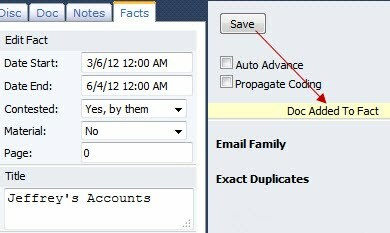 Under the section 'Assign Docs To Fact' type or paste the title of one or more documents to be added to the selected fact, and then click on 'Update'. You can copy the title of any document from the Browse, Search or Document Viewer pages. You can open any file in Lexbe eDiscovery Platform by right-clicking its title from the Browse or Search pages. When you select a fact, the editing tab will not only add the current document to the fact but also allow you to assign Case Participants and fact to an issue. >To obtain a listing of documents related to a given FACT or FACTS, select the fact or facts and then click Export>Export to Excel from the bottom left menu. >To obtain a listing of documents related to a given ISSUE, select the issue from the top left menu and then click Export>Export to Excel from the bottom left menu. >To obtain a listing of documents related to a given CASE PARTICIPANT, select the case participant from the left filter menu and then click Export>Export to Excel from the bottom left menu. >To download document related to particular facts, issues or case participants, go through the same steps as above and select Export>Export to Briefcase.